Aside from my friends from the Middle East, South America, and Europe… I’ve made friends right here in Pennsylvania. 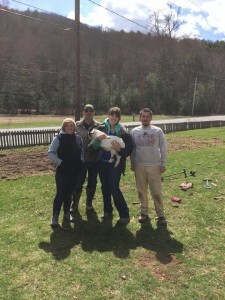 Earlier this week, I had the pleasure of joining some fellow Stealth Diggers at a property in Shamokin, PA.
My familiarity with Shamokin, PA consists mostly of driving by the exit on my way to visit family in Syracuse. 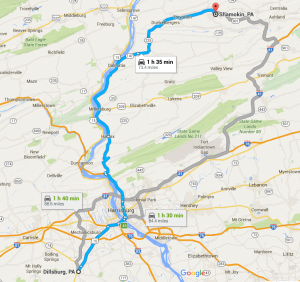 However, I do recall one occasion when my parents detoured through coal country to avoid traffic on 81S–whether or not we passed through Shamokin, I’m really not certain. I do remember seeing black mountainsides and decaying coal breakers. That haunting imagery chased me into adulthood and I squealed at the invitation to revisit those snapshots from my younger years. 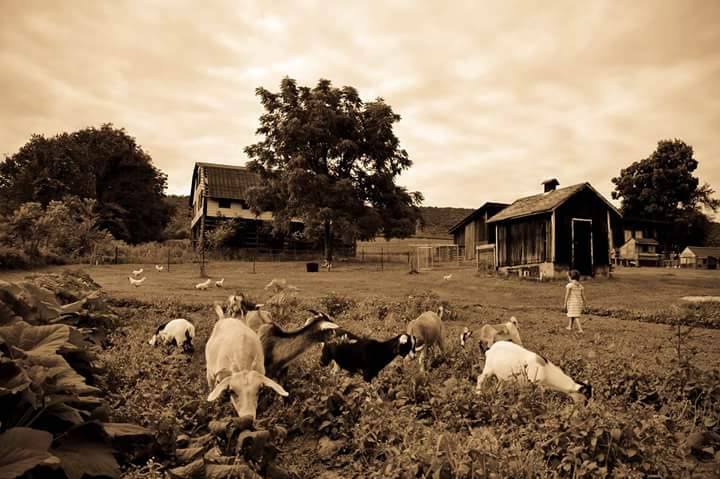 The Hungry Goat Produce! Located on PA 225 in Shamokin. I parked beside the barn and Ed Backes came across the field to shake my hand for the first time. We had met over social media last February, but this was our first time meeting in person. Our original Facebook introduction came as a result of my blog post about the Wright House. (The Wright House was my first underground railroad permission.) 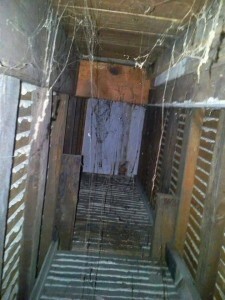 Upon seeing my write-up, Ed reached out to share photos of the hidden room his daughter had discovered beneath her attic floor. The secret room stirred speculations that the house may have been a station on the underground railroad. The secret room discovered under the attic floor. It measures 15′ long by 4′ wide by 5.5′ high. This potential underground railroad location is where I found myself shaking hands with Ed Backes. He quickly ushered me towards a concrete wall where the morning’s discoveries were on display–iron, clad, clad, belt buckle, iron, and… more clad. Contributing to the display were Don Shepherd, Brandon Smink, and Ciara Voneida–Ed’s daughter. Now, Don and I had corresponded a number of times on the interwebs, but this was our first time meeting in person. 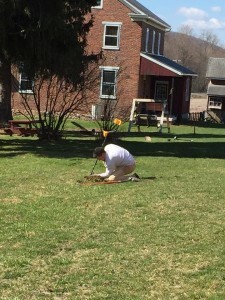 Despite still dragging from an organized hunt the previous weekend, Don still lived up to his reputation as being a well-seasoned digger. I very much enjoyed watching him work. In addition to Don and Ed, Ciara and I also had an online friendship to build on. We had become quick friends after Ed introduced us last year–bonding over goats, vintage-style, and our appreciation for the past. Of course, this was my first time meeting Brandon but I’m sure we’ll hunt together again very soon. 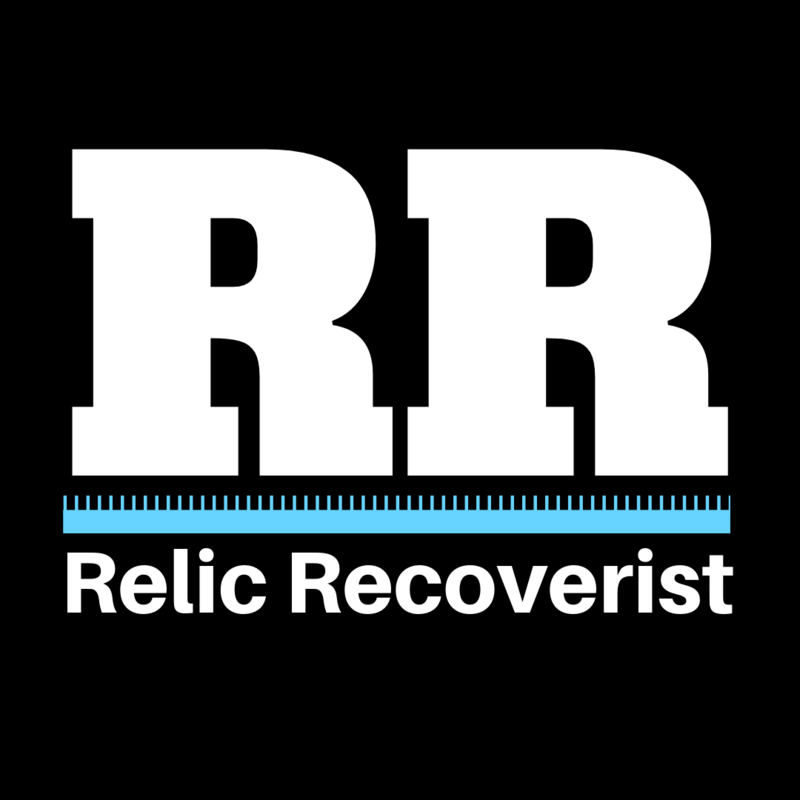 After the much-belated introductions, everyone grabbed their detector and scattered in opposite directions–such is the nature of metal detecting after all. 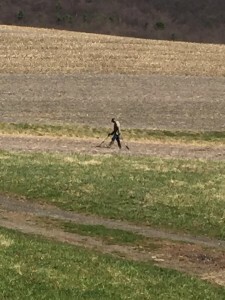 As much as I like to think of metal detecting as a social pursuit, there isn’t much socializing when everyone is tuned in and listening to their machine grunt and chime. Of course, that all changes when someone finds something worthwhile. Then we can all jump around and celebrate together. (Granted, I’m usually the only one jumping around.) To compensate for the lack of socialization, I usually end up talking to myself… such was the case on Monday. As I was trailing along the fields mumbling to myself, I found a few metal bobbles. I eventually turned up a solitary dime, which seemed to be a running joke with the others. According to Ciara, the family used to hold egg hunts in the field. When the kids came back with 600/800 eggs, the adults never bothered climbing through the fields in search of the missing eggs. (Year after year after year…) Apparently those missing eggs had been filled with spare change, because–collectively–the five of us dug fifty dollars worth of dimes that day. On a side note, Ciara promises to buy us all a round of beer when she finally cashes them in. 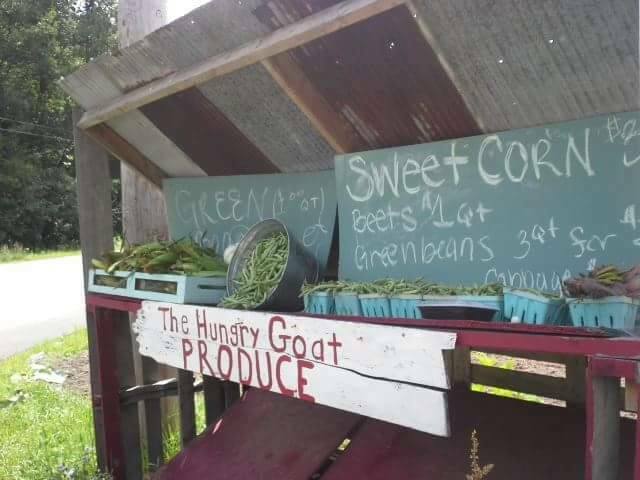 When the mid-morning coffee break was announced, I started back towards the house… only to be distracted by a smiling goat who gave the aforementioned produce stand its moniker. I chatted with Ophelia for longer than I should have, but–let’s face it–talking to a goat beats talking to yourself any day. I left her snacking on some grass and I wandered around the front of the barn, only to hear fast thumping approaching me from behind. I turned as Ophelia charged at me, dodging sideways before striking me in the knees and knocking me over. She stared at me, still smiling. Apparently, I had exited our conversation prematurely and she wanted more cuddles. 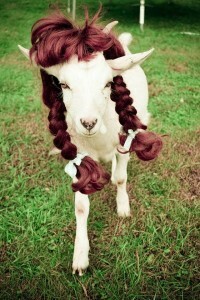 I obliged her. After sucking down some coffee, I headed outside to detect around the yard with the others who were fed up with digging dimes in the nearby fields. Don had already struck treasure with a flat button, shank still intact. I hovered long enough to film his discovery and wandered off with my XP Deus. My first hit along the side yard returned a crotal bell–my very first crotal bell. I’ll admit, I was visibly beaming. (You can watch my reaction in the video I posted to YouTube.) I pocketed the bell and continued along the front of the house. A moment later, my detector started squealing. I circled the signal a few times and engaged the pinpointer function. 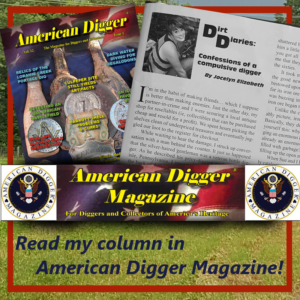 My fellow diggers got a kick out of the shrill scream. (Its a XP Deus thing, you wouldn’t get it unless you have one.) When I was satisfied with the target, I sliced open the plug with my predator shovel. As I bent down to remove the clod, dimes spilled all over the grass. I had discovered about thirty dimes–which amounts to either a Miller Lite or Coors Light, but none of that fancy European stuff. For my first coin spill, I’ll take it. We dug for another hour, but didn’t find anything terribly significant. There were no shackles or slave tags, much to my disappointment. I would have loved to have put some evidence behind the speculations that the property was part of the underground railroad. Before I returned to Dillsburg, Ciara invited me inside to see her box of dug treasures. 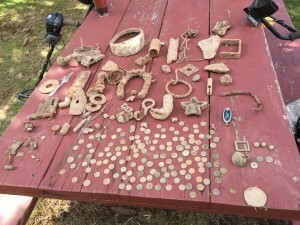 The wooden chest was filled with everything found on the property…. and then some. There were Hot Wheels and Matchbox cars, musket balls, and a vintage roller skate. Granted, there were also plastic bags filled with dimes–enough to buy a fancy European beer or two on my next visit. The crew minus Ed Backes. 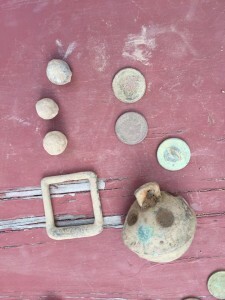 The day’s most significant finds: wheatie, indian head, three musket balls, a buckle, flat button, and crotal bell. Don Shepherd doing his thing. Brandon Smink recovering another dime (probably).